Banker, State Secretary of Revenue and community leader, Helen Powers has had an significant impact on her community and the state of North Carolina over her career. Junior Achievement Helen Powers was born in Madison County, when her mother was visiting the family farm. But her home and heart have always been in Asheville. She started work in 1945 at American Enka Company immediately after school, becoming the first woman at the firm to rise above the secretarial role to handle managerial responsibilities. In 1960, Helen joined the Bank of Asheville serving throughout the years in a variety of ever increasing management roles. When fire struck the Bank of Asheville building, Helen handled the emergency - working 36 hours straight to reopen the Bank in temporary offices across the street, restore all customer records and not miss a beat in serving the citizens of her hometown. Helen also lead the negotiations with the North Carolina National Bank when the Bank of Asheville was acquired. She retired as Senior Vice President of NCNB in 1980 - widely regarded as the most outstanding "lady banker." But Helen's work wasn't done. After working in the securities industry for a few years, she was called on to work for the citizens of North Carolina. 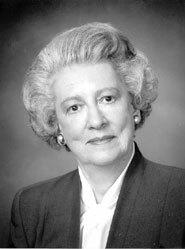 In 1985, Governor Jim Martin appointed Helen as North Carolina Secretary of Revenue - the first woman to serve in that capacity. She immediately dove into the task of modernizing the department, increasing revenues and working to build a much needed facility to allow the department to function into the 21st century. After five and a half years as Secretary of Revenue, Helen returned to Asheville. But Helen hadn't just helped to reshape the financial services business in the Carolinas. With her active roles in numerous groups, she played a pivotal role on business, civic and charitable boards. As she told a reporter once, "As a banker, you were always being asked to do things. You tried to be a good corporate neighbor. It was part of your responsibility." Identifying a critical need, Helen worked with Mission/St. Joseph Hospital to create a new and unique women's healthcare center serving western North Carolina. Helen also joined the board of Warren Wilson College, one of only 7 colleges requiring a work-study program for students. Located in Swannanoa -- near Asheville -- Warren Wilson dramatically grew over the past eight years with Helen chairing the college's finance and development committee.